• A New Scandal In Britain! A New Scandal In Britain! 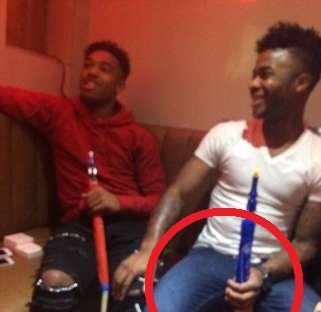 Ibe, a Liverpool prospect was dragged into Sterling’s ‘legal high’ scandal with some new pictures holding sheesha pipe in London bar. Recently, Liverpool has experienced fresh embarrassment over the off field behavior of their rising star player Jordon and fellow striker Raheem sharing a sheesha pipe. It is very understood that the conversation will be a paternal discussion rather than a more formal encounter involving disciplinary action, although Rodgers did criticize the 20-year-old, who scored the opening goal on Monday as Liverpool moved to within four points of Manchester City with a 2-0 victory over Newcastle, for “doing something a professional sportsperson should not be doing” by being photographed in compromising situations. However, within hours of Rodgers issuing that statement yet more pictures were published on some of the website, this time involving the up and coming teenager Ibe, who just like Sterling, is considering up his contract options. It is understood that the photographs were taken earlier this season when the players were on a night out in London. The club has declined to comment on the latest developments involving 19-year-old Ibe although they are particularly keen to draw a line under any controversy involving Sterling in particular, especially with his contract deliberations at such a delicate stage. With the Liverpool squad having been given a day off on Tuesday following the Newcastle victory, and the next day marking the 26th anniversary of the Hillsborough disaster – a day which will see all members of the first-team squad attend the annual memorial service, Rodgers is not due to address the off-field issues until Thursday at the earliest. However, Rodgers maintains that Sterling’s latest controversy is an issue of professionalism, neither the manager nor the club regards it as having damaged the reputation of Liverpool.